Egyptian President Morsi received a letter from Amnesty International Tuesday, October 2, along with reports highlighting the alleged human rights violations committed by Egypt's military and police against protesters over the last months of the revolution. 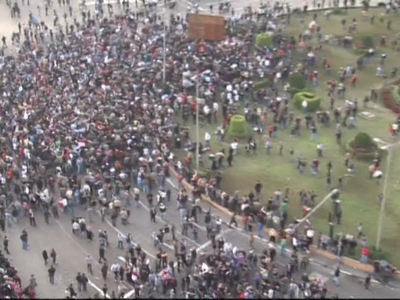 The letter urged Morsi to end the legacy of repression, torture and violence that former President Mubarak left behind. Hamas politburo chief Khaled Mashaal attended the anniversary celebration of Saladin's capture of Jerusalem on Wednesday evening, October 3, at Saladin Castle in Cairo where he made a statement urging leaders in the Arab world to liberate Jerusalem and Al Aqsa Mosque from the Israelis. Amnesty International sent a letter Tuesday, October 2, to Egyptian President Mohamed Morsi urging him to put an end to the “bloody” legacy of repression, torture and violence that have been used against protestors since the popular uprising that toppled Hosni Mubarak’s regime. Amnesty International highlighted the alleged violations of Egypt’s military and police against protestors over the past 20 months in two lengthy reports. Amnesty International said that Egypt's new leader had to make reforms to ensure accountability and transparency of the army and the police. The human rights group’s first reports sheds light on “Brutality Unpunished and Unchecked: Egypt’s Military Kills and Tortures Protesters with Impunity,” and the second deals with the "total impunity" of country's police forces against protestors. Amnesty International said that since the January 25 Revolution last year, as well as the violence used against demonstrators by Mubarak’s police, repression hasn’t disappeared in post-revolution Egypt, whether from the army or the police. President Morsi had previously vowed to set up a fact-finding committee to investigate the killings and abuses that took place under military rule, yet the committee has been given little time to gather findings, get information and summon witnesses, Amnesty International said. Hamas politburo chief Khaled Mashaal attended the anniversary celebration of Al-Quds (Jerusalem) liberation on Wednesday evening, October 3, at Saladin Castle in Cairo. In his statement during the celebration, which was attended by Egypt’s Cultural Minister Mohamed Saber Arab, urged Arab leaders to work on liberating Jerusalem and Al-Aqsa Mosque from the Israelis. Mashaal added that the Palestinian Authority has to stop pinning hopes on negotiations with Israel, and should resort to pushing away from the negotiation table and turning to resistance as the only way to liberate the Palestinian territories. He also stressed necessity for putting an end to inter-Palestinian division, mainly between Fatah and Hamas, and work hard to achieve reconciliation and unity. 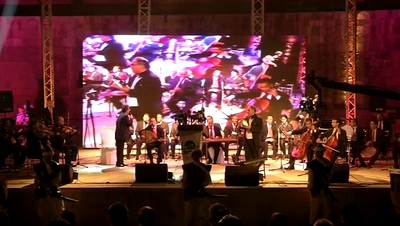 It included music performances of Palestinian folklore and national songs about Al-Quds.